Most days, I work from home, and making that arrangement work can be trying. 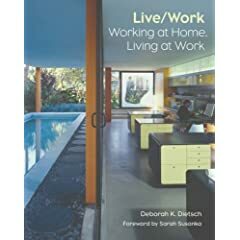 In Live / Work: Working At Home, Living At Work, Deborah Dietsch profiles thirty work/home integrations as well as their owners. The photography is stunning, and I found these incredibly clean, modern workspaces inspiring. This book could be an incredible resource for anyone who works from home, both to integrate (and demarcate) their work and living spaces. My next book is Veganomicon, by Isa Chandra Moskowitz.